On Wednesday, Apple released a new batch of Animoji characters that gives iPhone X users more virtual masks to play around with, but what many have been waiting for is an app that lets you put on a virtual mask of another person, not an animated emoji. Well, that day has finally arrived. 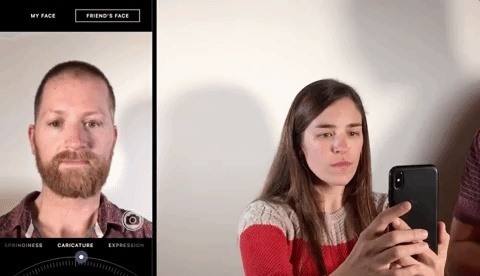 Created by Pancho Nonchalant, Flesh Mesh is a new app that lets you use the iPhone X's TrueDepth camera to scan your friend's face and then put that virtual mask on to smile, talk, and even look around. The video recording feature also includes audio, so the comedy gold here is the ability to record your friends saying weird things using your own voice. If you can imitate others' voices, even better. The real-time tracking of things like smiling and eye movements is fairly solid. But despite the relative accuracy, the margin between your face and the virtual mask makes this less of a tool to convincingly pretend to be someone else and more of a fun app to see what it's like to take on your friend's facial features. Part of the mask's uncanny valley-like lack of realism is also related to the app's inability to track the movement of a person's head, which means any expressions you make will occur while the face on the screen stays in one position. And if you don't have a friend's face to borrow, you can use the free app to exaggerate your own features with cartoonish effects. In addition to recording video, you can also save your creations as a still photo. However, any imagery you record will be tagged with a Flesh Mesh watermark that can only be removed if you pay $3.99 to upgrade the app. Overall, the app feels more like an "early days" TrueDepth camera experiment rather than something you'd use frequently. But with developers only having had the iPhone X in their hands for a few months now, it's nevertheless an impressive hint at the other kinds of face masking apps we'll see coming down app pipeline soon.